Birds of Prey #39, DC Comics, cover-dated March 2002. "The Gun," by Chuck Dixon, with art by Rick Leonardi, Jesse Delperdang, and Rodney Ramos. Whatever happened in that story line we covered in episode 14 where Bruce Wayne was arrested for murder? What happens when Barbara Gordon visits a suspect in prison? And what happens when a person with 2 X Chromosones shows up on the podcast? Link: Stella's excellent podcast Batgirl to Oracle. Next Episode: FREE COMIC BOOK DAY 2016! 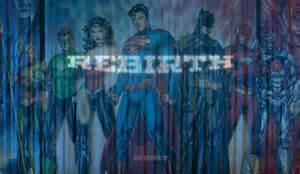 In this episode, we talk about what we think of the new titles that DC Comics is introducing as part of their "Rebirth" initiative. We also cover lots of listener feedback, including one that gives us a chance to talk about some of our favorite female characters in modern comics. Join us for all that ... and more ... in this episode of Shortbox Showcase. So what comic books did Professor Alan read since the last time he talked about the comics he read? What new books did he read right off the shelves? What pulp heroes did he read many stories of? What award-winning mini-series did he read? Listen to this super-special episode #10 ... and find out! ﻿﻿Next Episode: What comics did Professor Alan read during April? The episode should be out in early May. I was reading a comic recently, and ran across this ad for the three-issue prestige-format series from 1990. I covered the series in three episode, just about two years ago. 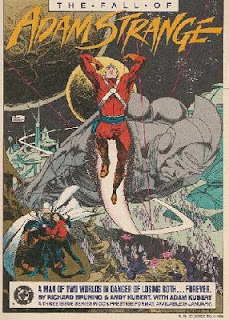 In the course of those episodes, I discussed how, although I enjoyed parts of the series, the overall arc of Adam Strange's character disturbed me, as did the grimness of the ending. 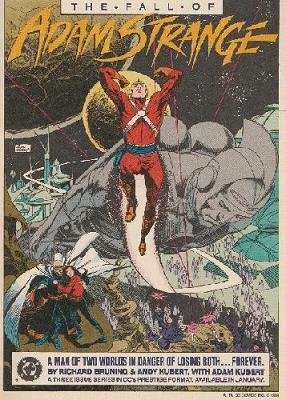 I wonder if my reactions would have been different had I known that DC had marketed the series by calling it "The Fall of Adam Strange." Knowing not to expect the Silver-Age style of his early adventures may have prepared me for this "darkening" of the character. But of course, had I known that's where the story was going, maybe I never would have picked up the issues. Welcome to the latest offering from the official podcast of the Bloodlines Best Event Ever Network. 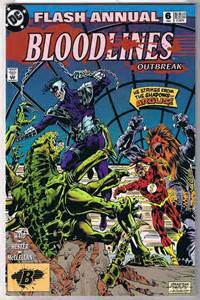 In this all-new, all-Bloodlines episode, we cover the awesomeness contained in Flash Annual #6 & Green Arrow Annual #6 . 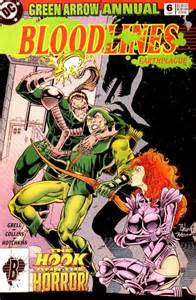 These incredible issues feature the fantabulous debuts of two of the most Bloodlines-errific characters EVER, The Hook and Argus. We tlk about these icons, as well as piles of listener feedback! Check out the other members of the Bloodlines Best Event Ever Network! Special thanks to Christopher Ouellette, from Beware of Monsters. You can follow the Bloodlines Network of Twitter, with #BestEventEver.